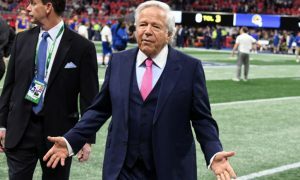 New England Patriots owner Robert Kraft and other men caught in a police sting operation concerning prostitution at Florida massage parlors have been offered a plea deal by the Palm Beach County State Attorney. The men must concede they would be found guilty, perform 100 hours community service, attend a class on the dangers of prostitution and pay $5,000 per count, spokesman Mike Edmondon said. Kraft was charged with two counts last month. On the one hand, if the evidence is strong that Kraft committed the acts it may be the smart thing to just accept the plea deal and move on. On the other hand, if the evidence is not clear and convincing, it may be worth fighting. Kraft has the resources and the damage to his reputation could be devastating. This isn’t just a prostitution arrest. The media has framed it as a human trafficking story, far more damaging to Kraft and his personal brand. The plea deal for the State Attorney is a shrewd move. Acceptance of the deal would accomplish all that would be accomplished in a guilty verdict with little expense to the taxpayer. There’s no real downside for the prosecutor in this one. We’ll see what Kraft decides to do.